I was invited to a Bridal Shower that had a tea cup theme. Unfortunately, I couldn't attend the shower as it was on the same day as Alethea's birthday party. But I did make a card and send a gift. 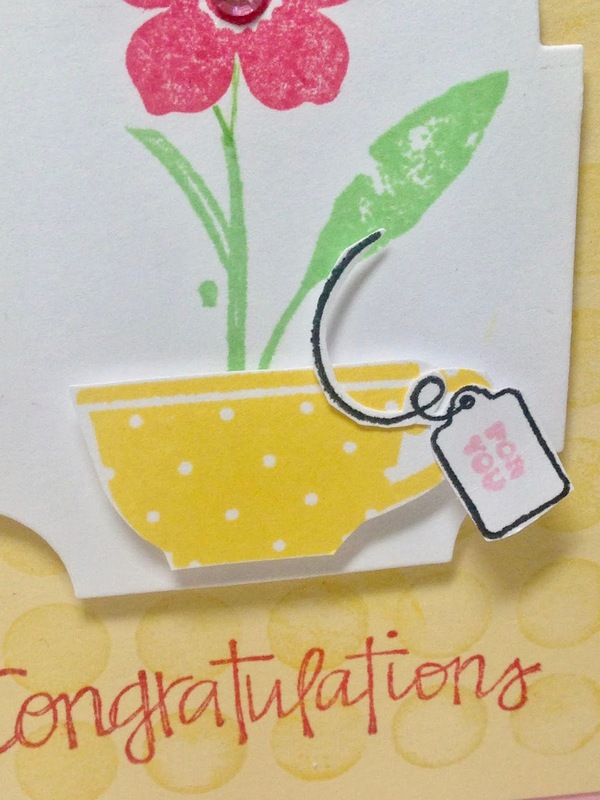 I chose to case THIS CARD because I thought the tea cup fit the tea cup theme of the party. The original card used all Papertrey Ink products. I had some of those items, but not all, so I substituted other stamps from my stash to use instead. I stamped the tea cup in yellow, cut it out, and popped it up on dimensionals. The tea bag was stamped, fussy cut, and glued to the tea cup. 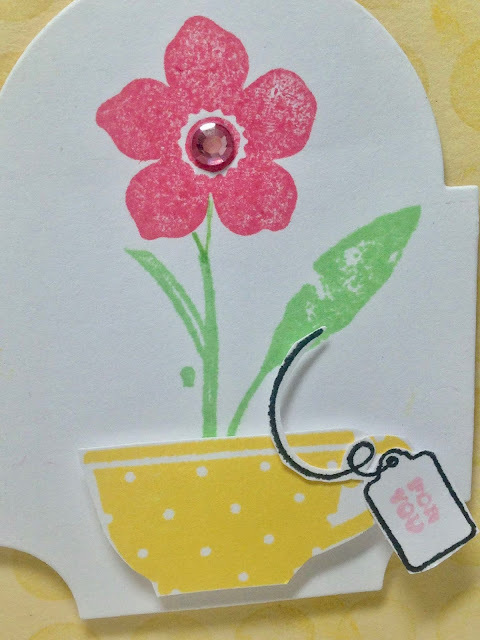 I stamped the flower in pink and green ink, then I added a adhesive crystal in the center. The white panel was cut with a Papertrey Ink Die, and also popped up on dimensionals. 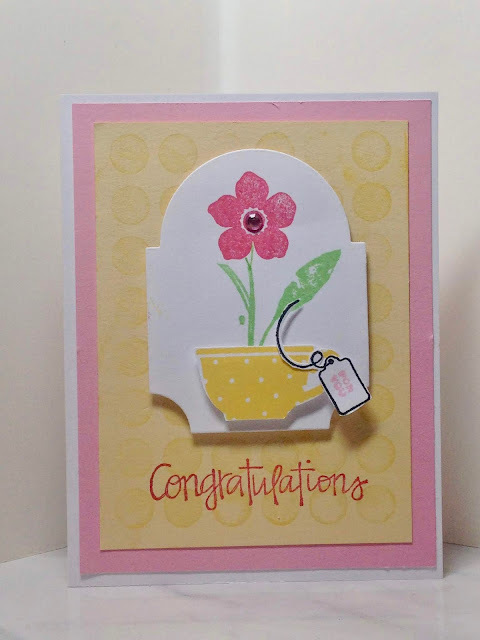 The yellow paper was stamped in Versamark with an old Stampin' Up! background stamp. 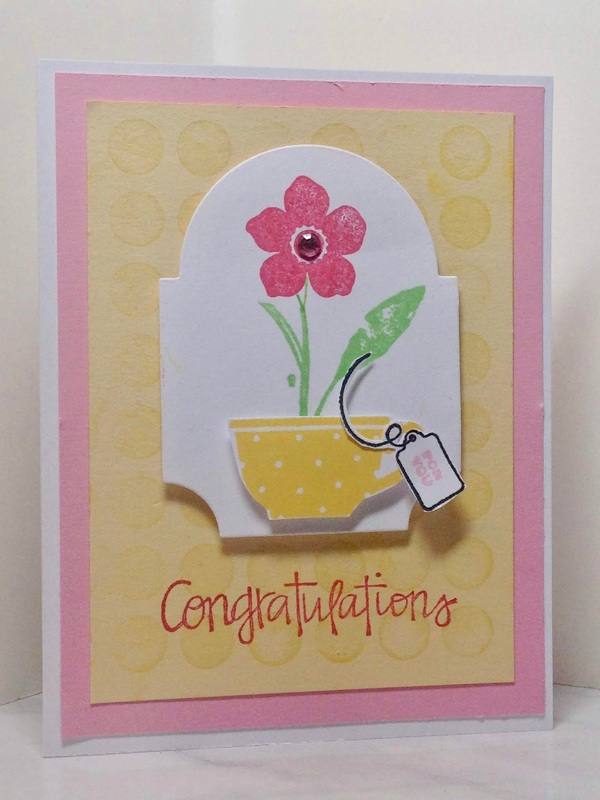 What a cute card and so perfect for the Shower theme! I enjoy all your posts, and it's so nice to still see some papercrafts on here as well!! Thanks Ellie! I post cards whenever I make them, but I don't make them too often anymore. OR, I make a holiday card and then I can't post them until after the holiday is over, because I don't want the recipients to see them on the blog before they receive them. Then I end up not posting them at all because I think "Who would want to see this holiday card now that the holiday is over?" What do you use to pop up things? You mention dimensionals. Is that a brand name? I have tried a couple of things but without much success and because I scrapbook, and have to slide the pages into the plastic protector, my pop up can't be too poppy. Darling card! Lucky recipient. Going to carve out a few minutes today to spend scrapping. Wanna come over? I had the same issue with dimensional when I use to scrapbook with paper and glue. Now I only scrapbook digitally. Cards can also be an issue with dimensionals because if they are too thick you can't mail them. If I know the card is going to be given in person, I'm more likely to use dimensionals. As for the brand, I use just about every style and brand. They come in all different thicknesses, and sometimes I just want a little pop and other times I need the pop to be a bit higher. My favorite is the kind that comes in a roll. It's just the right thickness and I can cut off only what I need. P.S., I wish I could come over and paper craft with you. It's been a long time since I had a friend who enjoyed paper-crafting come to my house. My daughter and I use to be able to work in the craft room together, but since she has had her baby, we have not.